Professor James Harrison, FRSC, FREng. Professor James Harrison Chairman of the British Coal Utilisation Association and formerly Director of the Coal Research Establishment for British Coal presented this year‘s ECG Distinguished Guest Lecture, which took place at Burlington House on March 24th 2010. Utilisation of coal. The Industrial Revolution was based on coal. But it was a matter of serious concern in the UK in the mid-nineteenth century that the production of coal from the known reserves would not be able to sustain the increasing demands of industry. By the year 2000 it was predicted, the country would need 2000 tons of coal a year if the rate of increase in demand continued. It was recognised that coal was being used ever more efficiently, but that increased efficiency brought with it increased demand – a message that the present government planners might heed! There was debate at the time as to the extent that the improvements in utilisation that the practical engineers were achieving would be helped by the more scientific approach of the developing understanding of thermodynamics. At least, it was said, the theories defined the limits of what could be achieved. The interplay of pragmatic improvements versus science continues as the technology of the use of coal has progressed and continues to progress. Although coal is no longer the main energy provider in the UK, it supplies about 45% of electricity generation. Worldwide, coal provides about 27% of world energy consumption and about 62% of electricity generation. Environmental impact. From the earliest times there have been problems with the adverse effects of dust and smoke and the other emissions arising from inefficient combustion in poorly designed plant. The efficiency of the open fire was only abut 25% and steam locomotives only about 7% overall. However, it was not until recently that the extent of the effects on the environment has been fully appreciated. Smoke and dust emissions were the first problems to be faced, by improving the efficiency of combustion, so that their reduction paid for itself by reducing consumption. Acid rain and carbon dioxide emissions have called for much more radical and expensive modifications to the technology of coal utilisation. Coal technologies. These advances have depended on a much fuller understanding of the underlying science of coal conversion and combustion. This has led to the introduction of many new technologies, but traditional technology has also benefited and has not stopped still. In the large-scale uses of coal, particularly iron-making and electricity generation, the newer technologies, designed to offer step-change improvements, are continually challenged by the more gradual advances made in the design and operation of established process plant. An improved version of the familiar is more acceptable, and less risky, than a radical new approach, as yet unproven. The use of coal for ironmaking is a good example of the interplay of science and practice. For thousands of years charcoal had been used to reduce iron ore, but when the charcoal supply dried up, ironmakers turned to coal as a substitute. The early methods of making coke imitated the process for producing charcoal from wood. Coal was allowed to smoulder in beehive ovens until the volatile matter had been driven off, leaving, when the right quality of coal was available, a residue which was hard, strong and porous and suitable for use in the larger furnaces that were being developed. Beehive ovens were still operating in Durham in the 1950’s, but by then the much larger by-product coke ovens had largely taken over. These could produce coke of uniform quality from a wider range of coal and also made use of the gas and volatile material released during the coking process. But although the larger furnaces and the new methods of making coke brought about benefits of scale, there was still much more art than science about the overall ironmaking process. How was coal converted into coke? What were the properties of an ideal coke? Was there a ‘coking principle’ that could be added to coal to ensure a good product? Could blast furnaces ever be run on scientific principles or was there an art that had to be handed down from generation to generation? As more was understood of the behaviour of different coals under different heating regimes and, in particular the interaction of competing chemical processes of decomposition and recombination was studied in the laboratory, the production of coke was put on a firmer base, allowing increased flexibility in the blending of the feed material and more control over the properties of the resulting coke. At the same time, the chemistry of the blast furnace was being better understood, so that the desirable properties of the coke and other ingredients could be better defined. This better understanding has led to great improvements in the overall performance of blast furnaces. A hundred years ago the production of a ton of iron in a blast furnace required the consumption of four tons of coal. In most recent practice this has been reduced to about half a ton of coal per ton of iron (Figure 1). One consequence of this great improvement has been to reduce the claimed advantages of alternative ironmaking processes – direct reduction of iron ore from coal or natural gas. These processes are of particular interest where there is a lack of suitable coal for cokemaking and for smaller scale applications. They contribute about 5% of the world’s iron production. Attention is increasingly being given to the need to reduce emissions of CO2 from ironmaking plant. One method under development by Corus involves the use of oxygen to replace air to avoid the introduction of nitrogen, recycling the offgas to the base of the furnace and the stripping of CO2. Although the world consumption of coal for ironmaking is about three-quarters of a billion tonnes a year, the demand for coal for combustion is far greater. In the UK some coal is still used for home heating, some in industry, but the greatest use is for power production. The transition from small scale uses to the large central plant has been brought about by a variety of factors, but the prime driver has been the environment. The first problem to be tackled was that of smoke from inefficient domestic and industrial boilers. The first approach was the development of smokeless fuels in the form of reactive coke and smokeless briquettes. A range of smokeless solid fuel was introduced in the 1950s and 1960s aimed at allowing the continued use of open fires, but with higher efficiency and no smoke. The other approach was to develop a domestic appliance that could burn coal itself, but more effectively and without producing smoke. The principles applied to these appliances are those that are still used for domestic and small industrial applications. However, in the UK domestic market coal was taken over by gas, first from oil and later by natural gas. Coal is better handled and more efficiently combusted on larger plant. The concerns about the contribution of coal combustion to acid rain gave an extra impetus to the development of fluidised bed boilers, because limestone could be added to the bed to capture sulphur compounds without the need for additional flue gas clean up as was needed in conventional pf plant The lower temperature of combustion in fluidised beds also meant that the production of oxides of nitrogen was lower. There was a major research project at Grimethorpe which proved the concept of pressurised combustion. This has been the basis of full scale plant abroad (but not in the UK). In conventional power plant, the need to reduce emissions of sulphur oxides required the installation of considerable plant to clean up the flue gases. Emissions of oxides of nitrogen, NO­x, also had to be addressed. The extent to which nitrogen in the combustion air is converted to oxides, is reduced at lower temperatures. Combustion temperatures have been lowered by developing burners in which air is introduced in stages, and by recirculation of flue gas, staging the introduction of air into the combustion space of the boiler. NOx can be reduced in this way, but a negative effect is that it is more difficult to achieve complete combustion. This is shown by the increase in the amount of carbon in the ash residue. A recent development is to identify the optimum combination of operating conditions at a plant, to minimise NOx and carbon in ash by computational fluid dynamics, taking into account the science of combustion and the practical restraints of installed equipment. These developments and the improvement of materials of construction have enabled the use of higher steam temperatures. The most recent plant, using superheated steam, can have overall efficiencies approaching 50%, compared with the 38% of plant with standard steam conditions. Further developments will take efficiencies even higher. Figure 2 is illustrative. However, if CO2 is captured for transport and storage, the overall efficiency of a pf (pulverised fuel) plant using supercritical steam would be reduced to some 25%. This drastic reduction in efficiency has increased the interest in alternative coal-fired systems. There are two main contenders Oxyburn – the use of oxygen instead of air for combustion in an otherwise conventional design – and systems based on gasification with oxygen using gas turbines and steam turbines in combined cycles. In both these routes CO­­­2­ does not have to be separated from nitrogen and in the gasification system it is captured at high pressure, ready for transport and storage. Oxyburn is currently at the small demonstration scale. It is being promoted in several projects, for example at Didcot where the development of computer models enables studies to be made of different configurations and different operating procedures before they are tried out on full scale plant. This means that many more options can be explored than would be feasible on the plant itself. There are several gasifiers that have operated for many years at the commercial scale. They differ in the method of feed – pulverised coal with oxygen and steam; in a suspension in water, or as a lump solid. The resulting gases may be cooled in a heat recovery system or by direct quenching with water. They are finally treated in a variety of cleaning processes. The process gas may be used directly or modified by shift reactions to adjust the ratio of CO to hydrogen. There are therefore several options in the choice of gasification system to meet the needs of individual sites and for particular applications. The first gasification combined cycle plant was built in Germany in the 1970s. Since then a series of plants have been built with increasing efficiencies and more are under construction, for example in China. In Britain the project at Hatfield has received European support. 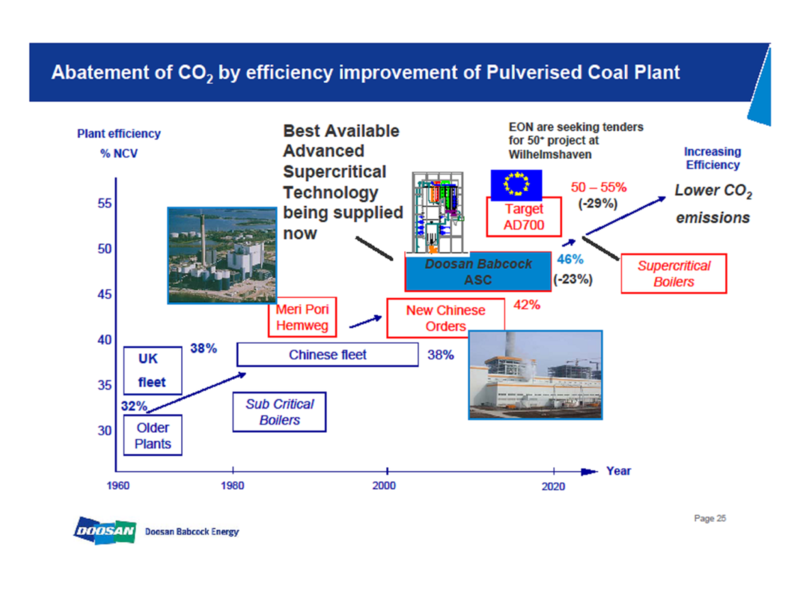 Current progress in the efficiencies of power plants based on oxygen-gasification technologies is summarised in Figure 3. In considering the merits of the different options for future power plant, the need to cater for the capture of CO2, has become one of the most important criteria. Many studies have been made of the merits of the options for power generation, pre-combustion with its large efficiency penalty or post combustion with high capital costs. These studies indicate that in general there is little to choose between the overall economics, so the final choice will depend on the different conditions at different sites which may favour a particular option. Although all the components of the various options for CO2 capture and storage have been operated on the large scale separately, there is the need to demonstrate their robustness in power generation. These issues are the heart of the Government’s competitions, which are intended to demonstrate carbon capture and storage in four projects using different systems. In order to reduce the duplication of CO2 handling facilities, it would it be desirable for the Government to promote a national scheme for transport and long term storage, taking into account problems of ownership and responsibility for health and safety aspects. Progress is needed rapidly, not only because of the urgent need for new plant in the UK, but also because solutions are needed for application to plants abroad, as in China and India, where new coal-fired plant is being brought into operation almost daily. In the UK, the need to clean up fuel for transport is likely to require demand for electricity for road and rail transport and/or for the production of hydrogen, if that becomes the preferred solution. As long as any fossil fuel is used for electricity, any renewable electricity will be most effectively used as electricity, rather than converted into hydrogen. This means that hydrogen would continue to rely on fossil sources, which in practice means coal, as supplies of natural gas become increasingly difficult to maintain. Established gasification processes can be used, and there is much activity in current R&D programmes aimed at refining the conventional route from coal and in developing new ones. For example, studies of conventional gasification followed by cryogenic or membrane separation indicate that hydrogen costs could be lowered considerably and co-production of hydrogen and electric power might lower costs further. The proposed gasification plant at Hatfield is considering the merits of such a combined objective. In the longer term more novel routes from coal to hydrogen are being developed, for example those based on chemical-looping cycles. There are many reserves of coal worldwide that are uneconomic or impossible to recover by conventional mining for reasons of quality, accessibility or depth. Many trials have been carried out in the attempt to recover the energy in the form of gas produced by the introduction of air or oxygen with steam directly into the coal seams. There are formidable problems to overcome in controlling the combustion/gasification reactions, in managing the strata in which the coal occurs, in preventing leakage between workings and to the surface and in obtaining a consistent and long-tem product gas. Although short term success has sometimes been obtained, no project has been operated on a commercial basis. The technology is being re-assessed in many parts of the world at the present time, taking into account the advances that have been made in drilling and linking technology in the oil industry. There are several pilot projects, but little information has been released from them. The rewards of success would be considerable. Coal will continue to have an important role in contributing to the supply of energy in the UK, as in many other parts of the world. For this to be compatible with the reduction of emissions of carbon dioxide, there is urgent need to demonstrate carbon capture, transport and storage. The components are operating on the large scale in different applications around the world. There is no reason to doubt that they can operate successfully together, but this needs to be proved by the demonstration of total systems operating on a power plant. There is a case in the UK for the Government to promote a national pipeline grid with designated storage sites with appropriate monitoring provisions for the long term. There is also the need for assurance from the government that the investment in the additional plant would be economic, for example by a guaranteed price for carbon.